Little Big Dash received incredible growth of over 350% year-on-year in Brisbane, while Sydney finished 137% over the target and 7,100 participants during the second year of the event. Sanitarium pride themselves as the leading food manufacturer in delivering positive health and wellbeing projects to the Australian community. They are famous for their production of Weet-Bix, UP&GO and So Good. Sanitarium came to us with their latest idea to create heathier, happy lives in the community – a fun obstacle course for families to enjoy together. They needed us to come up with a name, brand profile and digital strategy to make it a success and so Little BIG DASH was born. The goal was ultimately to transform a brilliant idea into a tangible result through an inspiring brand, engaging content, a conversion optimised website and targeted digital strategy across multiple touch points. 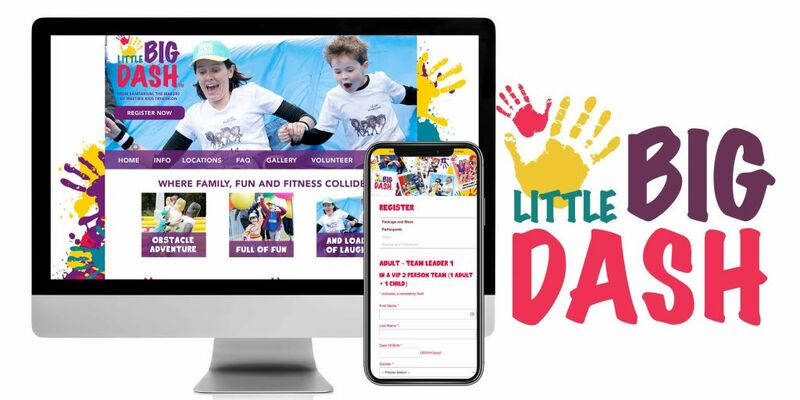 Little BIG DASH had to drive registrations but also empower an active community by encouraging exercise as a fun family day out. Experiential events had seen a considerable rise in popularity and have a strong position within the community psyche. We used this positive association, as well as bright, positive branding, to build strong awareness and online engagement to drive mass participation to the event through digital conversions. The juxtaposition of the name, combined with the fun colours and symbolisation of the parent and children’s hand print captures what the event is all about and garners attention online. The branding provided a solid foundation to make Little BIG DASH a success. Combined with the website and conversion-centric landing pages, we had all the artillery we needed to generate large numbers through the site. We used a number of digital channels to drive the traffic including Facebook, Google Display Network, YouTube and eDM. It also allowed us to optimise our ad targeting and messaging through various stages in the purchasing funnel to really drive the best result/conversions. Through the digital platforms, we were able to build a loyal following on Facebook and Instagram, with Facebook and our eDM sequences acting as the primary conversion driver and the secondary channels providing supporting messages and remarketing. Our data-driven approach to this campaign allowed us to consistently scrutinise the numbers by refining our targeting and testing the efficiency of the content. With 1,000 participants at the pilot event just eight weeks after inception in 2014, Little BIG DASH took off in 2015 – achieving sold-out events in Brisbane and Sydney. Brisbane achieved incredible growth of over 350% year-on-year, while Sydney finished 137% over the target and with 7,100 participants. This was Sanitarium’s single biggest event ever.